Laser therapy allows energy from light to stimulate tissues and promote healing. Our Animal Hospital uses lasers to stimulate specific accupoints on the body to not only heal tissue but to regulate disease forces with out the use of potentially toxic medications. This approach is unique and the only service like this offered by a veterinary clinic in the Louisville area. Laser therapy is the use of concentrated light (photons) to stimulate tissue cells to work better. This is different than a surgical laser (hot) that is used to cut cauterize tissue. Cold laser is used to take away inflammation, increase blood flow and circulation, remove extra fluid in the tissues, decrease pain and accentuate the healing process. 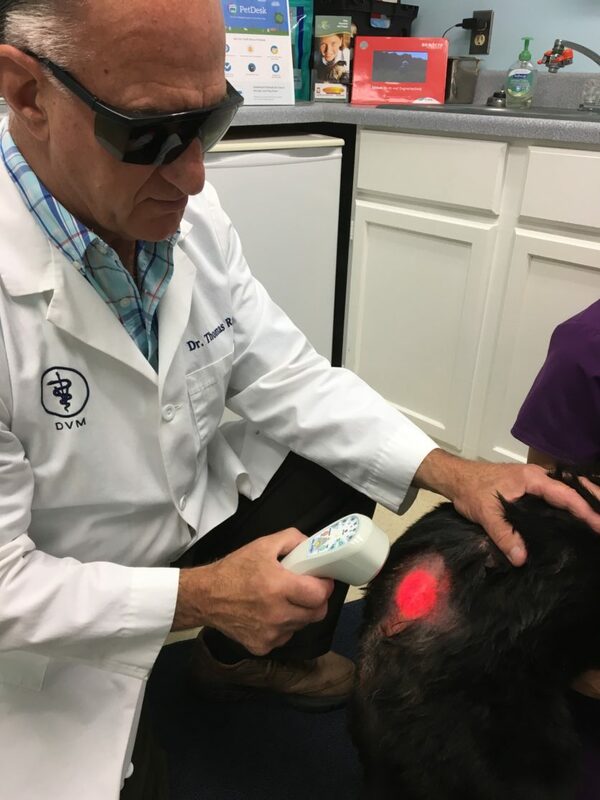 Many conditions benefit from laser therapy; arthritis, strains, ligament damage, pain, inflamed gums, skin disorders, and post surgical healing. We also use laser to stimulate acupuncture points without needles. Ask if your pet will benefit from this therapy.